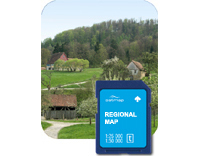 Satmap Alberta (NRCT 1:50k) (CA-REG-50-SD-001) | Discount GPS Accessories from mysatnav.ie Ireland's leading GPS & Sat Nav store. Alberta is the most populated of Canada's three prairie provinces and has large tracts of boreal forest and flat grasslands spread across its length; while along it's south-western border lies the gateway to the Rocky Mountains. Like its neighbour British Columbia, Alberta boasts excellent terrain and facilities for the outdoor enthusiast. Banff National Park, Canada's most visited park, lies within Alberta and is connected to Jasper National Park by the scenic Icefields Parkway route. There are five of the country's world heritage sites within Alberta including the Canadian Rocky Mountain Parks and Waterton-Glacier International Peace Park. Although abundant with natural beauty, in recent times the Athabasca oil sands covering a vast area towards the north-east of the province have caused controversy with the mining of its extraordinarily large deposits of sought after energy sources.